BALTIMORE – What we can expect from the Trump administration is coming into clearer focus. Mr. Trump may be impetuous and unpredictable. But the economic policies of his administration are not. The system depends on more and more credit (debt). Households are tapped out. Businesses are near their limit. Only the feds can add more credit into the system. As we warned here, no matter who won the election, the Deep State would be forced to move toward fiscal stimulus. “The Donald”… with support from a Republican Congress… will move aggressively. But we’ll take a hard look at the dots tomorrow. Today, we look at death. We drove down to southern Virginia on Sunday. Word had come up from the Appalachians that our mother was about to bring down the curtain. At 95, she is having a hard time breathing, eating, or just sitting up. Last week, Leonard Cohen died. So did Janet Reno and our old friend Howard Ruff, a pioneer in the newsletter business. On the way down to Virginia, we listened to Shelby Foote’s history of the War Between the States. Mr. Foote is not one to pass up a colorful detail. His history takes about as long to get through as the war itself. It was America’s most catastrophic war… with 600,000 dead. “It’s easy to die. And there are a lot of ways to do it,” wrote a soldier in a letter to his family. The state of Virginia alone suffered 30,000 military casualties at the hands of the Yankees. Virginia had a population of only 1.2 million at the time. That would be the same as about 8 million deaths in America today. No one has ever convincingly explained why it happened. Not for lack of trying. Slavery, states’ rights, Lincoln – you can throw up lots of “reasons.” But imagine the poor soldier. Did he care about states’ rights? Probably not. And if he cared about slavery at all, it is unlikely that he was ready to die for it… one way or another. Lincoln bears an overmeasure of responsibility; he almost seemed to want war. But why did so many go along… all the way to the grave? Here at the Diary, we are connoisseurs of disaster. We study it the way some people study ancient Sumerian texts or Chinese porcelain. Not natural disasters; what interests us is the man-made kind. And what most intrigues us about them is that people are so eager to get involved. In Gone with the Wind, for example, Rhett Butler sees the war with a cynic’s eye. He takes advantage of the situation, running the Union blockade and earning a fortune. But even he cannot resist. Before the war is over, he puts on a gray uniform and signs up for the Great Cause. Some go to war for glory. Some go to avoid shame. Some joined the Union Army in the 1860s because they had to – like the thousands of Irishmen who survived the Great Famine by emigrating to America, only to be conscripted and killed at Shiloh or Antietam or Gettysburg. And many went as a matter of principle – like those who fought for the New York Volunteers or the Charleston Irish Volunteers – though it is hard for us to understand exactly what principle was involved or why it was worth dying for. Slavery was a serious issue; but the rest of the world managed to abolish it without bloodshed. We drove on… battle after battle… skirmish after skirmish… surly soldiers, vainglorious, incompetent officers… introductions to “Bobby” Lee and U.S. Grant… along twisty Virginia roads, until we finally arrived near Lynchburg. Further Reading: Don’t forget to keep an eye on your inbox this evening. We will be sending you a special edition of the Diary with more details about Porter Stansberry’s Big Trade. Today’s chart is of the U.S. Dollar Index. This measures the exchange value of the dollar versus a basket of six major trading-partner currencies. As you can see, the index has shot up 2% since Donald Trump’s win last Tuesday. Money goes where it’s treated best. And in the currency markets, that means where it can earn the highest rate of interest. 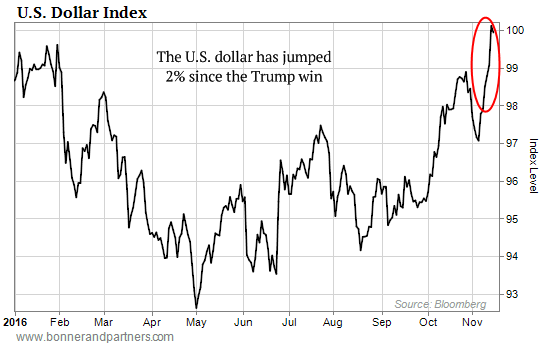 A surging dollar signals that investors see higher interest rates, as a result of higher growth, under President Trump. The reason why gold stocks perform better than gold is simple: They offer leverage to the gold price. That’s why the returns can be spectacular. Lots of great feedback today on the coming Trump presidency… and whether or not it’s a boon for the Deep State – the unelected “shadow government” of insiders that runs America – no matter who sits in the White House. You can catch up on Bill’s views on the matter here. Hi Bill, love your stories. Can’t get enough of them. Problem: I would have thought an insightful person like you would have realized just how deeply entrenched Donald Trump is in the Deep State. Not since Ronald Reagan have we seen such an unabashed member of the Parasitocracy while an apparent “champion of the underclass,” gorging himself (and his cohorts) on the carcass of ordinary America. If you thought the Obama years were good for the military-industrial-financial complex, we will look upon these next four to eight years as the salad days of the Deep State. Dear brilliant writer Bill Bonner: Would you consider playing the "what if" game? What if Donald Trump is not going to D.C. to ensure the Deep State’s survival at all? What if he’s the most enthusiastically sincere president we’ve seen since JFK? You do a good job of complaining about the Deep State. How about stop whining about them and do something to stop them? I think you should send your resume to President-elect Trump and explain how you can help him counter the Deep State. Bill is on target about Trump and the Deep State. First thing I read this morning – he is considering [JPMorgan Chase CEO] Jamie Dimon as Treasury Secretary. His other choice is Steven Mnuchin, a Goldman alum. Wonder how long it will take the masses to realize nothing is going to change. The Deep State train will continue to roll down the tracks. The only thing I can think of that a president can do is what Gary Johnson did as governor: veto every spending bill or tax increase that hurts people, or gives special favors to those with the clout to get the bill through the legislature. It may be a drop in the bucket, but it is in the right direction to insist that Congress meet a higher bar to override the veto. Mr. Bonner will continue his travels, and the “establishment” will retreat to their caches of non-performing currencies. We the “silent majority” will revert to the survival methods we have learned from the many prior disasters the elite have blessed us with. 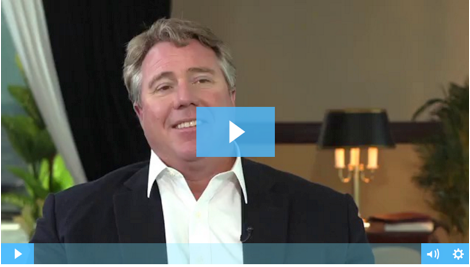 Porter recently sat down with Palm Beach Research Group founder Tom Dyson to discuss his Big Trade. You can watch it here.